A week ago, Toby Stewart got out of the shower and flipped his TV to CNN. He was getting ready to put on his uniform and head to work at Taco Bell, but he couldn’t stop watching the coverage of Occupy Wall Street, the demonstration filling Lower Manhattan’s Zuccotti Park. 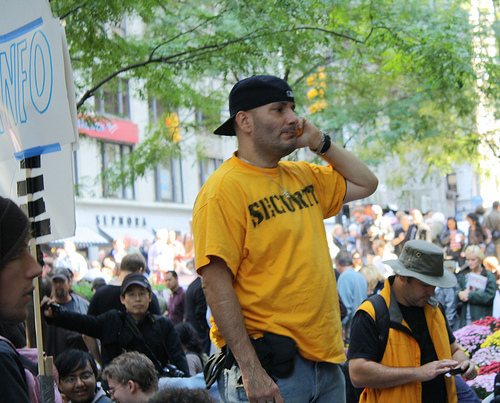 The anti-corporate, disenfranchised spirit of the rally resonated with Stewart. Though he had a job, he had been unable to pay his bills for a few months, and he couldn’t find extra work where he lived, in Pueblo, Colo. So he made a decision: he quit his job and headed to Occupy Wall Street. “I told my friends, ‘You only live once,’” the 34-year-old said. He was unhappy at work and the protest inspired him to take action. “I figured if I was going to be depressed, going nowhere, it’d be better to come here, to New York City,” he said. 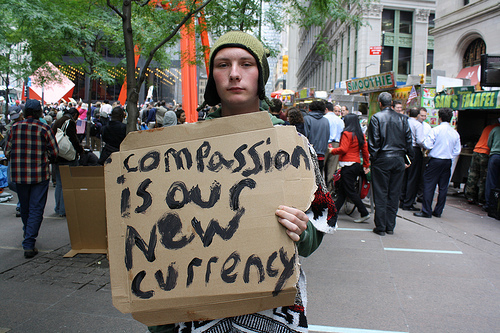 Stewart, who arrived in Manhattan this morning after spending 50 hours on a series of Greyhound buses, is one of a legion of new additions to the 3-week-old Occupy Wall Street movement, which is growing both in New York City and across the world. “There are twice the amount of people here (today),” said Brendan Anderson, of Midland Beach, Staten Island. The unemployed 22-year-old has spent six straight days in Zuccotti Park and nodded emphatically when asked if the scene was different now from when he first arrived. “Everyday it’s growing,” he said. 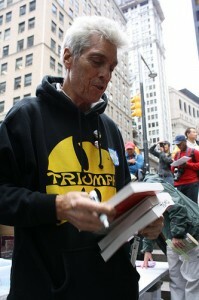 Eric Seligson, 65, who volunteers at the occupation’s library, said that he noticed a huge spike in attendance over the weekend after police arrested 700 protesters marching across the Brooklyn Bridge. The Greenpoint, Brooklyn native estimated that there were 2,000 people in the park on Sunday, the day after the arrests, and about 1,000 on Monday. “If the cops thought (the arrests) would discourage people, they were wrong,” he said. Kristin Schall, who was arrested on the bridge on Saturday, agreed. Schall, 27, a student at Brooklyn College who lives in Pelham Bay in the Bronx, has visited two or three times a week since the movement launched September 17. She said there are more people at the site each times she visits. “It seems to be growing every day,” she said. 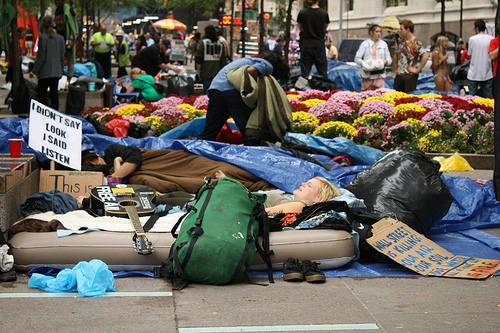 That growth has been fueled in part by an amalgam of different visitors to the Occupy Wall Street site. In addition to new protesters, the site has received media members, celebrities, tourists, activist groups and politicians in recent days. “Today is absolutely hopping,” said Lynn Rosen, 64, of Canarsie, Brooklyn. Rosen was volunteering with a group seeking petition signatures against hydraulic fracturing, or “fracking,” a drilling procedure used by natural gas companies to extract gas from rocks deep beneath the earth’s surface. She freely admitted that the reason her group chose to visit Occupy Wall Street was because of the amount of people at the park. Another visitor hoping to engage with protestors was Republican City Councilman Daniel J. Halloran III. While defending the availability of jobs in his home district of northeast Queens, he bemoaned corporate greed and answered questions from a swarm of interested observers. 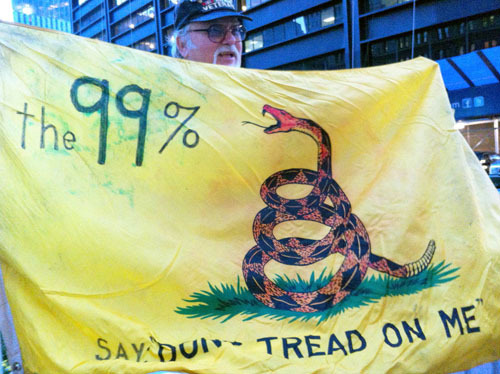 As more guests and observers visit Zuccotti Park in Manhattan, the Occupy Wall Street movement is also picking up steam in other cities. 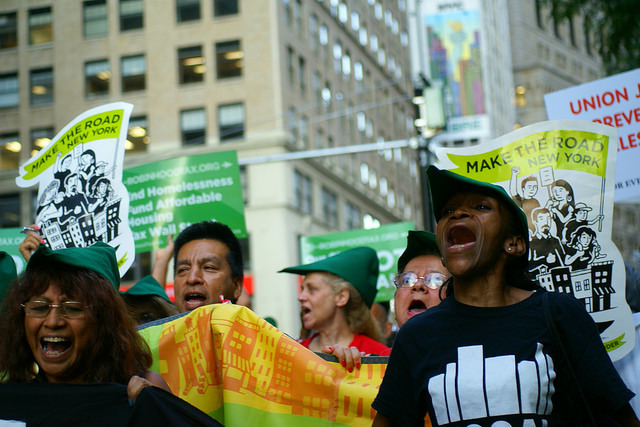 Similar encampments have sprouted up in Los Angeles, Boston, Chicago and Washington, D.C., and multiple trade unions, including the Transport Workers Union, the United Federation of Teachers, and the Service Employees International Union, will participate in an Occupy Wall Street march tomorrow. Kristen Carter, 46, a tourist visiting the site from Rhinebeck, N.Y., said that the more support the movement received, the more likely it was that change would occur. “I think it’s coalescing,” she said. And Stewart, who plans to search for work in New York while living at the occupation site, hopes that all of the increased attention leads to real change.